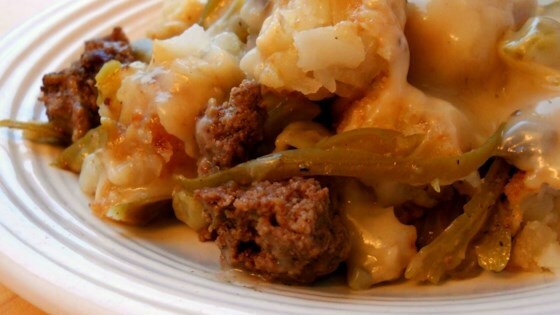 "This is an old recipe, easy and kids usually like it. If you like, add green beans over the hamburger and skip the onion rings if desired." In a large skillet cook ground beef with onion, salt and pepper; drain and spread into the bottom of a 9x13 inch baking dish. Add tater tots; mix cream of mushroom and cream of celery soup together and pour mixture over dish. Top with onion rings, if using. This turned out awful. I baked it for one hour and the hamburger on the bottom was burnt. Guess I should have checked it before the hour was up. I added Grated chedder cheese to the sauce mix. If you do this there is no need to salt the recipe. It did seem to cook much faster than indicatedd in the recipe, so check it often. Very Good!